Welsh Hymn Calon Lân (Pure Heart)? Bren Terfyl, the world famous opera singing Sheep has Kindlyagreed to perform this heart rendering, 19th century Welsh Hymn Just for you. Complete with subtitles, you can now practice to your heart’s content until you mastered this Welsh masterpiece. 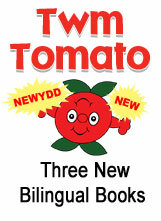 The very popular children’s book character, Twm Tomato features in a further 3 new books this autumn. The latest books, Published by Gwasg Garreg Gwalch are written in Welsh with English translation and follow on from the great success of the first two books published last year. 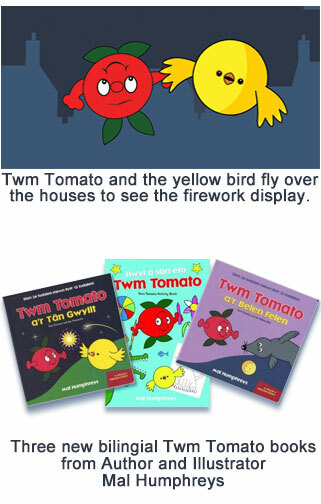 The new titles are Twm Tomato and the yellow ball, Twm Tomato and the fireworks display and an activities book titled Fun with Twm Tomato. “It’s very satisfying to have five books in the series.” Said writer and artist Mal Humphreys. The series is very unique, in that they are the worlds only upside down back to front books. You can read the story from back to front, turn the books upside down and the story continues back to the front. Since the early 1980s, Welsh politicians have had to worry about how the cartoonist Mumph will portray them -and dread that he will ignore them. Now a selection of his work has gone on show at the Galeri in Caernarfon. Mumph has drawn over 3,000 cartoons for the Western Mail alone and has also produced work for Daily Post and currently for the South Wales Echo. 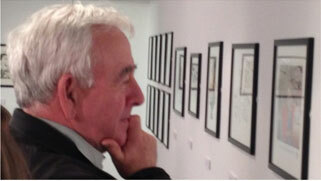 Lord Wigley popped into the exhibition to check up on Mumph.